According to a recent news feature from WCVB Boston, police have just arrested a school bus driver who allegedly crashed into a utility pole when his bus was loaded with students. 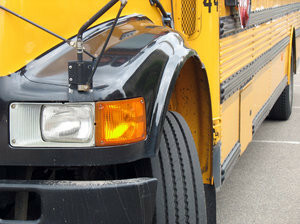 Police have said driver allegedly admitted to being under the influence of Nyquil and Dayquil, which he had consumed earlier in the day than when he was behind the wheel of his school bus. Prosecutors said that driver allegedly had a blood alcohol content of more than four times the legal limit for someone driving a commercial motor vehicle. It should be noted that while blood alcohol limit for driving a private vehicle is .08 grams of ethanol per 100 milliliters of blood, a driver with a commercial driver’s license (CDL) operating a commercial motor vehicle (CMV) must maintain a BAC of .04. The reasons for the stricter standard in a commercial motor vehicle are that a large vehicle with air brakes takes a lot longer to come to a complete stop, as they are many times heavier than personal vehicles, so the driver is required to react a lot earlier to potentially dangerous situations. Since alcohol is well known to slow reaction time, it is virtually impossible to safely drive a commercial motor vehicle under the influence of alcohol or drugs. It is also more likely that there will other types of accidents such a truck jack knife or rollover truck accident. At the time of this alleged accident, there were 11 students on the bus, and the utility pole landing was knocked down and landed on an SUV. Luckily, there was nobody in the SUV at the time it was crushed by the large pole and electrical wires. When police arrived at the scene, they said driver had difficulties walking down the bus steps, and for that reason they had to board the bus. While this may come as a surprise to some, it does not matter if a person is under the influence of beer, whiskey, or cough medicine, when it comes to a drunk driving charge in the Commonwealth of Massachusetts, because the actual charge is called operating a motor vehicle under the influence of intoxicating liquor or drugs (OUI). If the alcohol comes from cough medicine, which is present in Nyquil, it will be measured in breath alcohol or blood tests the same as the alcohol in vodka. The reason for this is because it is ethanol, which is chemically identical in both Nyquil and vodka. It also causes the same drowsiness and loss of coordination. In the case of cough medicine, it may be worse, because of effects of the decongestants and other drugs. Not only is this true in terms of getting arrested for drunk driving, it is also true in terms of a drunk driving accident caused by someone taking any kind of medication. Any medicine that causes drowsiness is required to say that someone should not drive or operate heavy machinery after using it. This means that anyone who chooses to take the medicine and ignore the warning is being negligent, and this may make him or her liable in Boston drunk driving accident lawsuits. It should be noted that this driver has not been convicted of any crime in connection with his recent arrest and is presumed innocent unless and until he is proven guilty. f you or someone you love has been injured in a Boston drunk driving accident, call for a free and confidential appointment at 1-888-367-2900. Bus driver accused of drunk driving argues he only drank cold medicine, February 12, 2016, WCVB Boston, By Jorge Quiroga.